The Gallipolis Elks 107 received at $2,000 grant from the Elks National Foundation to purchase peanut butter for the Gallia Snack Pack Program. The Snack Pack Program started in 2007 serving one elementary school and has expanded its program to provide snack packs to over 750 students that qualify in all elementary schools in Gallia County, Gallia Academy Middle School and Gallia Academy High School. All donations to Snack Pack go directly to purchase food items for the students. Elks members Bill Johnson, Gary Harrison and Fred Bryant along with Snack Pack representative Nancy Blevins are shown at the Snack Pack Distribution Center at the Holzer facility on State Route 850 where the peanut butter is delivered. https://www.mydailytribune.com/wp-content/uploads/sites/42/2017/09/web1_0914172149.jpgThe Gallipolis Elks 107 received at $2,000 grant from the Elks National Foundation to purchase peanut butter for the Gallia Snack Pack Program. The Snack Pack Program started in 2007 serving one elementary school and has expanded its program to provide snack packs to over 750 students that qualify in all elementary schools in Gallia County, Gallia Academy Middle School and Gallia Academy High School. All donations to Snack Pack go directly to purchase food items for the students. 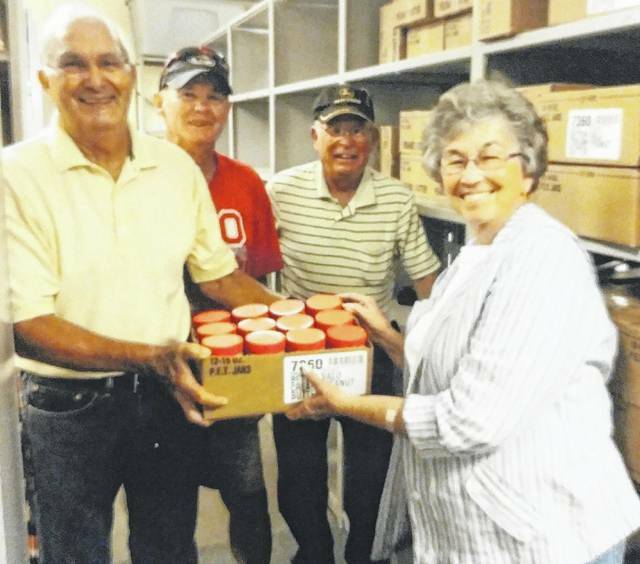 Elks members Bill Johnson, Gary Harrison and Fred Bryant along with Snack Pack representative Nancy Blevins are shown at the Snack Pack Distribution Center at the Holzer facility on State Route 850 where the peanut butter is delivered.